Read posts about apps and sites and tools to use in your classroom. Respecting and citing the work of others is an important aspect of digital citizenship. However, it seems to still be largely overlooked in our classrooms. It is important for our students to understand copyright, fair use and creative commons. One VERY simple way to cover this is by having students practice finding and citing creative commons images for their projects. These are not apps but websites meant for finding and citing copyright-friendly images. Both sites use flickr creative-commons licensed images and "stamp" them with a flickr attribution. 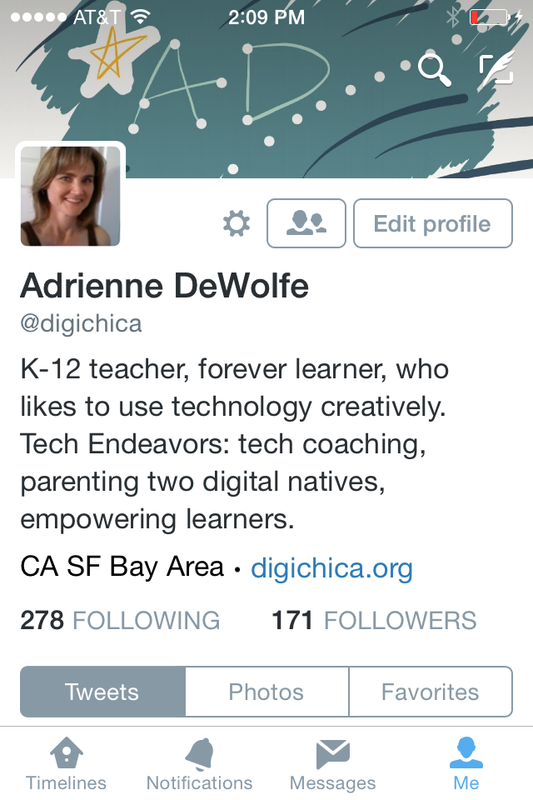 I recommend adding a shortcut to either site on your student devices. Images can be used to support student projects. Not only will students find appropriate images, but the "stamping" of the image presents a teachable moment. Even in kindergarten we can talk about respecting other people's work and the "stamp" placed on the bottom of the image, lets people know who took the photo and that they've given permission for us to use it. Below you can see what the product looks like for each resource. The stamp also saves valuable time by providing the attribution right on the image. Students don't have to try to record the URL or other info since it's done for them. Finding appropriate content online at the right reading level can be challenging. Below, are some of my favorite search engines that are kid-friendly and safe. There are a number of ways to find online content or adjust online content by reading level. Readability-Score.com will provide you with the grade level of any text or site. See this playlist from Susan Oxnevad on Search Engines for All Learners. Note that as of May, 2015, google removed their reading level filter. Rewordify creates an easier reading version from any URL or text selection. This is a cool tool that you must check out! When you select "Rewordify web page text only" you are able to have the tool teach you the difficult words or create flashcards in a Learning Session. Helpful with English learners. On the Mac, you can select any text and right click (control click) to enable the Speech option. The Mac will read the selection aloud. Read more. In iOS, go to Settings/General/Acessibilty/Speech to enable the Speak Selection option. Now when you select text, the Speak option will appear. You can also adjust the speaking rate or highlight words as they are read aloud. Read more. The Mac and iOS Safari browser allows for a reader view. Reader view provides a clean interface with images, sidebars and other distractions eliminated from the page. Readers can just focus on the text. Image demonstrating Safari Reader View from jennygrabiec.com. There is a lot of buzz around the use of infographics for learning these days. Photo collages are a good example of tools that can be used to create a powerful infographic utilizing images, text, video and sound to explain a difficult concept. We will look at three photo collage tools. Education Technology and Mobile Learning also has a helpful article on creating classroom posters/collages. Glogster Edu is a really fun collage tool that allows you to include linked videos, audio and text. The annual license fee that accompanis the online version and the new app, may turn some educators away. You will have to weigh the benefits. Thinglink is an alternative with many of the same features except that you select one image as the background and layer additional images and videos on top as information labels. Like Glogster, Thinglink has a FREE individual user version and a premium version that allows teachers to create multiple student accounts. Read about the considerable educator discount here. Pic Collage is ap(p)-tly named (no pun intended). This FREE ios and android app creates collages with your images. You can also add text and video and create an informative poster. Save your work to the photo library or send by email. There are some social features of the app, that you will either want to turn off in settings, or you can try their new "kid" version of the app. To turn off the social features and image search, see the sidebar of my handout. Have students synthesize their learning on a particular subject by carefully selecting a collection of images and adding text to show their learning. Use just one image with much text for a report. Use it for sequencing images from a story or directions for younger students. 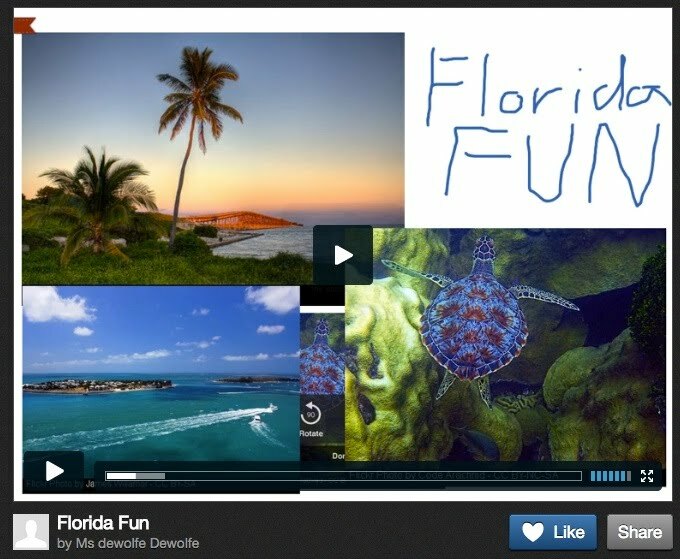 Share collages of field trips or class activities and enhance them with audio in audioboo or another audio app. See my blog post to view other student examples. 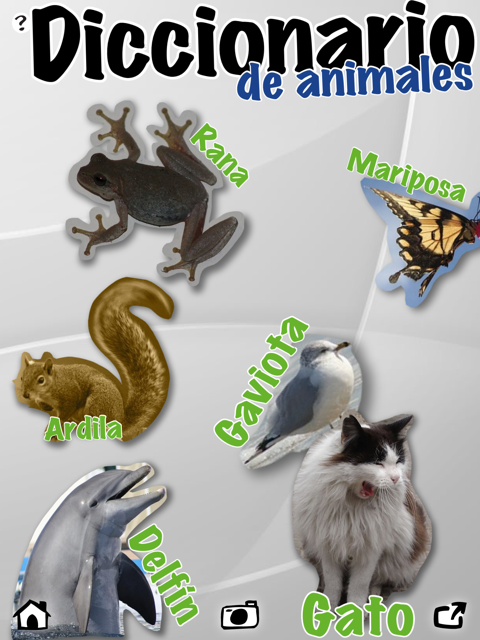 Photovisi is a simple collage maker that includes a text tool (an important feature for classroom projects). No account is needed. This tool is only web based and does not work on ios. QR Codes or Quick Response Codes can be generated for text and links. Links can be to sites, images, audio and videos, anything online that you'd like to share easily. You or students, will need to make the codes first and print them out or post them online. I-nigma is a QR code reader, for all platforms including iOS, Windows and Android phones. Go to the site http://goqr.me/ to make a code. You will find it is easier to make on a computer than a tablet. Select the type of code you will make. Type or paste into the box. Select download. OR go to the site http://qrcode.kaywa.com/ to make a code. Choose URL or text and check the static box. Type or paste into the box and your static code is created. Right-click to save the image. Paste in the URL you want to shorten and it will also generate a QR code. Be sure to click on "Details" to see the QR code and download the image. Use my FREE Doc template for saving and printing out multiple codes. Link to an audio review of a book using a tool like Audioboo or Croak.it. Read more. Use QRvoice.net for a simple text to audio recording and upload. Link to audio for other purposes like class rules, teacher directions, vocabulary words. Paste codes to students desks for Open House. Codes can link to student-made videos or other work. Parents scan codes at Open House to view their child's work. View my 5 minute screencast to learn HOW to make your own QR codes. I love screencasting for the simple reason that it allows me to capture a student's understanding and thinking. It's as if I'm sitting right there next to them, listening to them think aloud. Not only do I see what they know, but I also get a rare picture of their misconceptions and misunderstanding. It allows me to target exactly what that student may need in order to deepen or correct their understanding. Take a look at this screencast from a 2nd grader explaining equivalent fractions. What can we learn from the students' pause, erase and redo portion of the screencast? 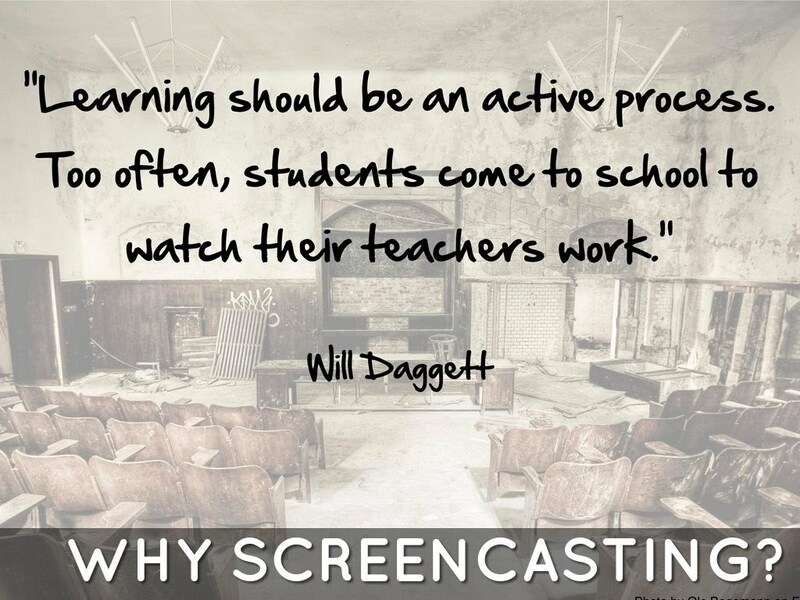 There are a number of screencasting apps out there. If you'd like to know more about different free ios screencasting apps check out my screencast comparing these tools. One of the free apps, Educreations, also has a web-based version that should work on other devices and laptops. 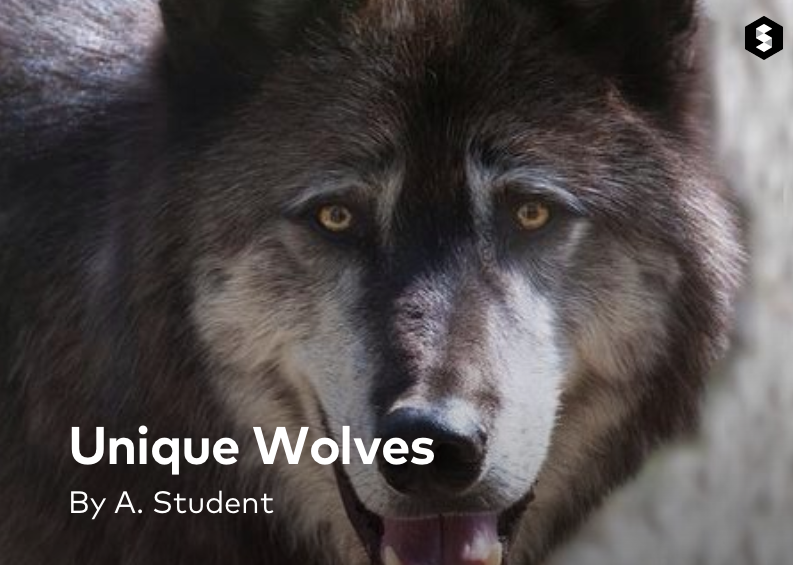 Austin High School creates their own "Kahn Academy"
Besides screencasting, there are a number of other ways that technology is can be transformative for assessment when used optimally. Online discussions can be a glimpse into student thinking. There are many free tools out there. Padlet is one that is very versatile, working on all devices, and allowing posts that contain text, images or videos. Kristen Wideen, first grade teacher, has a great blog post about using padlet for KWL charts. She has her students get to the padlet URLs by scanning a QR code. Learn more about QR codes here. Here's an example Padlet. What do these 3rd graders understand about polygons? I also use Skitch to have students annotate images to show their thinking. Even when in an app, students can take a screenshot, bring it into Skitch and use text, diagrams and labels to show their thinking. What can we learn about this student's understanding of narrative plot? Click here to view this ShowMe demonstrating descriptive writing by a 3rd grader for a travel brochure. ShowMe is a very simple, kid-friendly screencasting app. With the updated version, it now allows for multiple screens, and it has a text tool. I love its simplicity for very young students. The other attribute that distinguishes ShowMe from Educreations is that it can be replayed on any device from the web. With Educreations, you must have the app loaded on your iPad to replay. Since we will be using QR codes and parents' smartphones at Open House this year, I recommend ShowMe so that parents can scan the QR code and view their child's Screencast video on their phone. 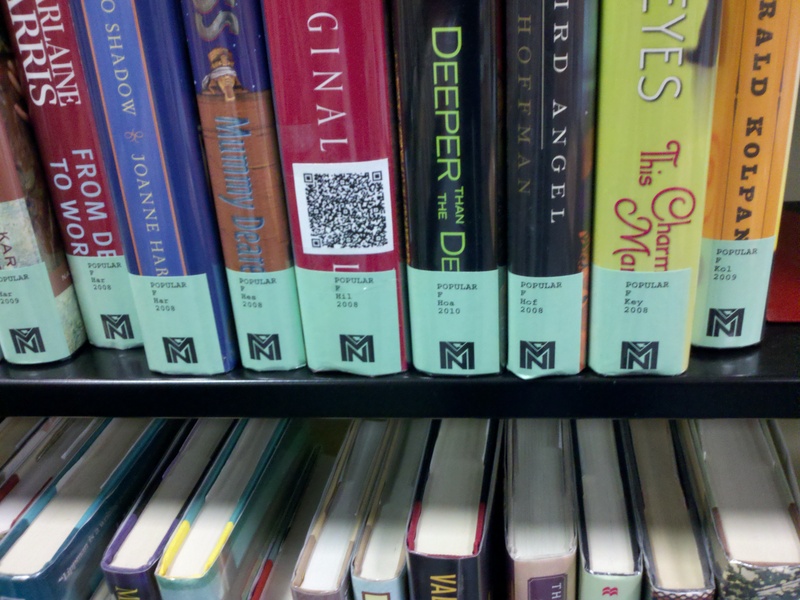 Read more about QR Codes and Open House. In ShowMe, like Educreations, you upload your video to the ShowMe website and can search for other lessons. Note: You will need an account to upload to ShowMe and student accounts can be created without email addresses. If you'd like to know more about different free screencasting apps check out my screencast comparing these tools. I learned of app challenges from Craig Badura's iPad Task Challenges. I tried them out with some of the teachers I work with, and they were a big success. I've created several more and posted them to the right. If you use them, I ask that you please send me a tweet @digichica or contact me by email. See Craig's post to learn more about his idea. I've used my app challenges a little bit differently than Mr. Badura in that I usually bring two challenges of the same "learning genre" and give teachers a choice. Yesterday we were digging into the genre of visual storytelling. 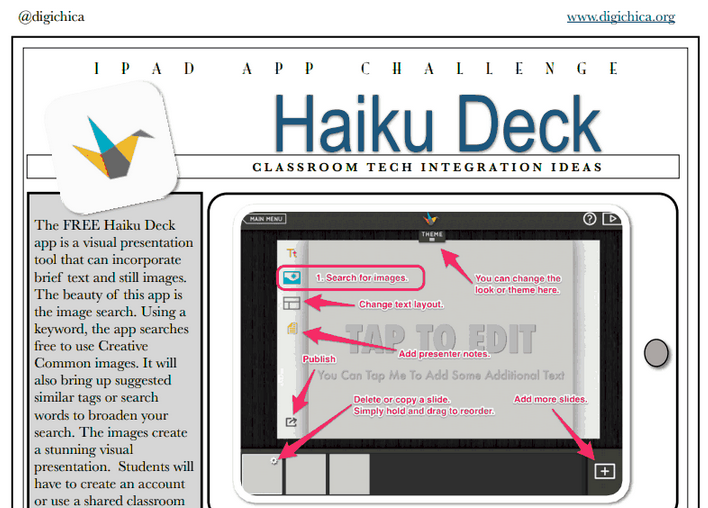 I offered teachers the option to create with Haiku Deck or Storehouse. Everyone likes to have the option to choose their learning (something we need to constantly remember in our classrooms). I've designed the tasks to give teachers a "how-to" with the app as well as an "app-lication" of the app in a sample classroom project or assignment. It can be very challenging to train or coach teachers that are in very, very different places with their technology comfort and experience. With the app challenge, they have a guide to the app, can create at their own pace and extend their learning with more classroom ideas. In just an hour every teacher has created a classroom sample with an app that interested them! Thanks again for the inspiration, Mr. Badura. The Storehouse app is a visual storytelling tool that can incorporate text, still images and video. Because Storehouse can also import images from your Dropbox or Instagram accounts, this is a great app for teens in middle and high school. I like to think of this app as Storykit for big kids. See my post here on Storykit. The image-driven layout makes any story come to life with ease. Students will have to create an account or use a shared classroom account. Completed stories are published to the Storehouse site with a unique URL that updates anytime you edit the story. Students can email you the link to their final story.